"Jeeping Was So Much Fun! " Brilliant– really appreciated the hotel pick-up. Allowing us to rent the Jeep the night before our jaunt really helped by letting us make an early start to the Needles district of Canyonlands National Park. Can't believe we made it over Elephant Hill! 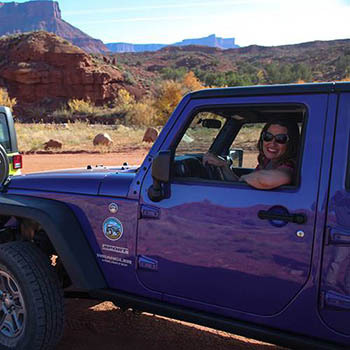 We rented a modified Jeep and took the Shafer Trail, starting from Potash Road! What an awesome trail and the spectacular views….not to mention the switchbacks!!! Most exciting thing I have ever done. I took a movie during the switchbacks and can’t wait to show my friends. We rented a Jeep for one of our two days in Moab last weekend. We entered Canyonlands via the Gemini Bridges trail and left on the Schaefer trail. The ride was thrilling and the scenery was absolutely spectacular. The Rubicon jeep is a very capable vehicle with comfortable front seats. Reserved a Jeep Rubicon online about month before the trip. Very easy. Showed up the night before the rental day and they let me take it home the night before so I could start out early. Jeep was in good shape, clean, and ready for trails with good tires and a lift. They gave me maps of the trails and the jeep ran great. Very easy process and the people were friendly. I will definitely be back to Moab and rent a jeep again from the Moab Adventure Center. We also did a half day rafting trip with them and it was just as easy and professional. I highly recommend the Moab Adventure Center.